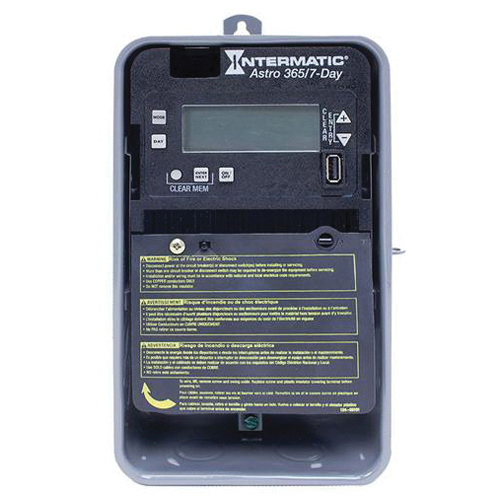 Intermatic ET2800 Series 1-Pole astronomic electronic timer control with 7-day timing range, has SPDT contact configuration. It has current rating of 20-Amps and voltage rating from 120 to 277-Volts AC at 50/60-Hz. Timer control with ON/OFF action, has a contact rating of 20-Amps at 120 to 240-Volts AC/28-Volts DC resistive, 20-Amps at 120 to 240-Volts AC inductive, 20-Amps at 120 to 277-Volts AC magnetic ballast, 10-Amps at 120/277-Volts AC electronic ballast, 1 hp at 120-Volts AC, 2 hp at 240-Volts AC. It has NEMA 3R metal outdoor enclosure. Timer control in gray color, has steel construction for durability. Timer control with wired connection, supports a conductor size of 18-10-AWG. It withstands a load capacity of 1 hp at 120-Volts AC and 2 hp at 240-Volts AC. Timer control is LED compatible and programs are repeated on a weekly basis. It measures 6.5-Inch x 3.625-Inch x 10.125-Inch and withstands a temperature ranging from -40 to 155 deg F. This timer control with supercapacitor backup, has 100 Hour backup protection time and 30-min backup restoration time. It is suitable for interior lighting, exterior lighting, electric pumps, electric motor control, various other electrical loads. Timer control meets cULus and CA Title 20 standards.